Soft water from two wells and hand-cultivated brewer's rice and careful preparation give the hand-crafted sake Yamato Kotsuchi its rich, full-bodied flavor. 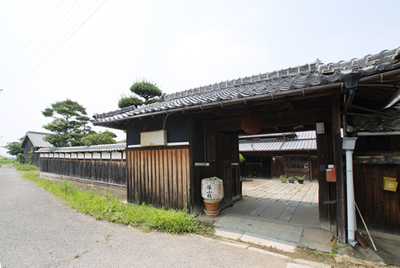 Having the sake brewery amidst such tranquil scenery paints quite a picture, doesn't it? the mark of an old Japanese brewer. The 5th head of the family, Takayasu Izawa. Our village of Imami is famous for producing rice and even appears in the ancient Manyoushu, Japan's oldest collection of poetry. Our brewery was founded here in the 16th year of Japan's Meiji era (1883), and it really fits in among the abundant waves of rice. It's been in my family for five generations. Looking back on our company's history, we, too, went through a period of mechanization in the age of mass production--and yet here we are, in the modern day, and we've returned to our roots of traditional hand-craftsmanship. Our ideal is "quality above all." Of course, with locally-made sake, you cant beat hand-craftsmanship. 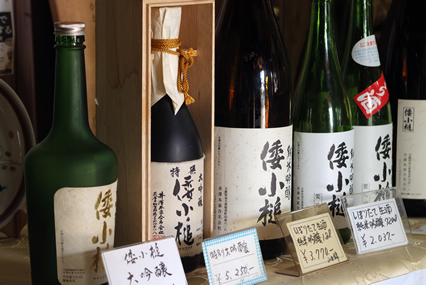 You can't make good-tasting sake without a human's experience and intuition. 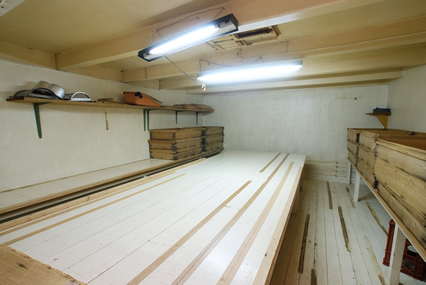 What distinguishes your Yamato Kotsuchi flagship brand? A clean brewery. Everyone is silent when it is timing for preparation. We gave Yamato Kotsuchi its name in the banner year of 1940--the 15th year of Japan's Showa period, when our nation was celebrating its 2600th anniversary. "Yamato" means "Japan," and "Kotsuchi" means "mallet"--referring to the mallet wielded by the god Daikokuten said to grant wishes. The name expresses a wish for Japan to flourish to even greater heights. 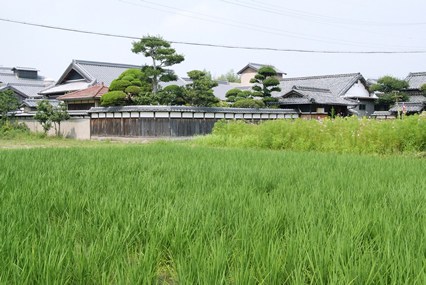 For the rice we use in our sake, we use as much as we can of local Imami home-grown grain. Of course, the taste of the sake made from this land goes best with the land's other products. 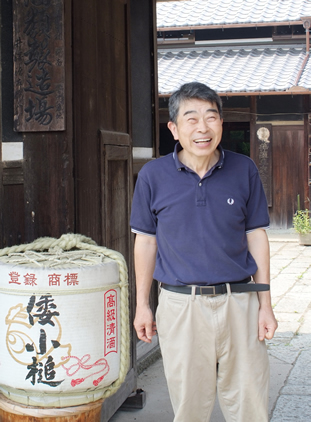 And Yamato Kotsuchi couldn't be made without the fresh water from two wells on our premises. Our water is gentle and sweet--just as the name "soft water" implies. When we brew our sake with well water, I think it's best to let it slowly, slowly ferment. It gives the finished product a full-bodied, gentle flavor. The sake tastes sweet, with umami, but it feels smooth and refreshing going down. It's a very Japanese sake--just a small amount is completely satisfying. Yamato Kotsuchi has so far won gold 11 times at Japan's National Research Institute of Brewing. You're careful in how you select the ingredients you use, I see. The paddy field in front of the Izawa house's grounds. This is where making delicious Japanese sake begins. Since we're located in a rice-producing region, we of course grow our own brewer's rice to bring out the flavor of the land. We use about a hectare of paddies. We take care of our land as a family, but rice cultivation is quite difficult. Even so, the thought of delicious sake spurs us on. Yamato Kotsuchi is a Japanese sake that has to this day been held in high esteem, especially by the locals, so we want to continue to concentrate on quality from the ingredients on up to create a Japanese sake that lingers on the local tongue. It seems as if your son will be following in your footsteps. There are many different types of Japanese mallets. we pick our favorite and use it. My son's come back home, and I'm thinking about having him take over as owner and chief brewer one day and having him make sake using the brewer's rice we've grown in our personal fields. Since last season, our longtime chief brewer hasn't been able to join us. We've had to hurry up and have people who've previously brewed at major manufacturers come over and help us out. We've been getting things done with my son, myself, and three others. I thought that they'd have a different way of doing things, since they're from major manufacturers, but there are wonderful ways of doing things at the major brewers, and I'm learning a lot from them. We're all united in the desire to make delicious sake, and that's reassuring. We've a small brewery, but I hope that future owners and chief brewers will continue to make our "small," homemade sake. For me, I want to continue forward with my son and keep on doing our very best. The milled rice 50% Yamada Nishiki, over time at low temperature, and finished in a soft taste with the roundness and elegant fragrance. In sake incense fruity, dry it and clean. I thoroughly enjoy the taste and flavor of rice. Taste well-equipped that seems to aging wine in a faint fragrance. Even according to the meat dishes as red wine.